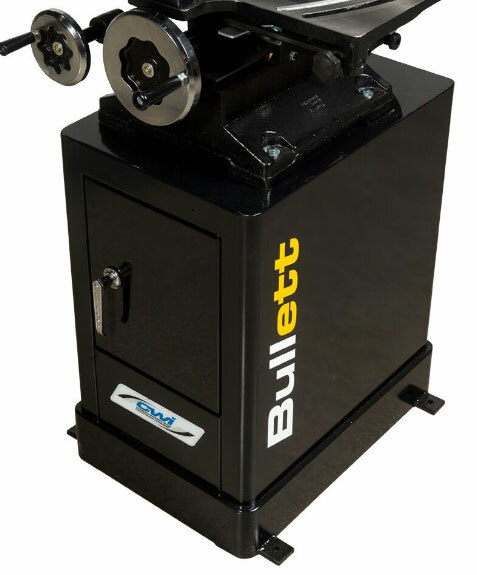 The Bullett CWI-M070 mortiser stand is made of heavy gauge steel to support the weight of the heavy cast iron CWI-M075T Tilt Head Bullett mortising machine. The M075T will bolt directly to the cabinet as the mounting holes are already drilled. The stand features a hinged cabinet door and storage inside for accessories and machine parts. There are also holes in the base for bolting to the floor in heavy applications. Browse the product archive. Type: Drilling Equipment. Brand: Bullett. Accessory: Accessory Product. Bookmark the permalink.